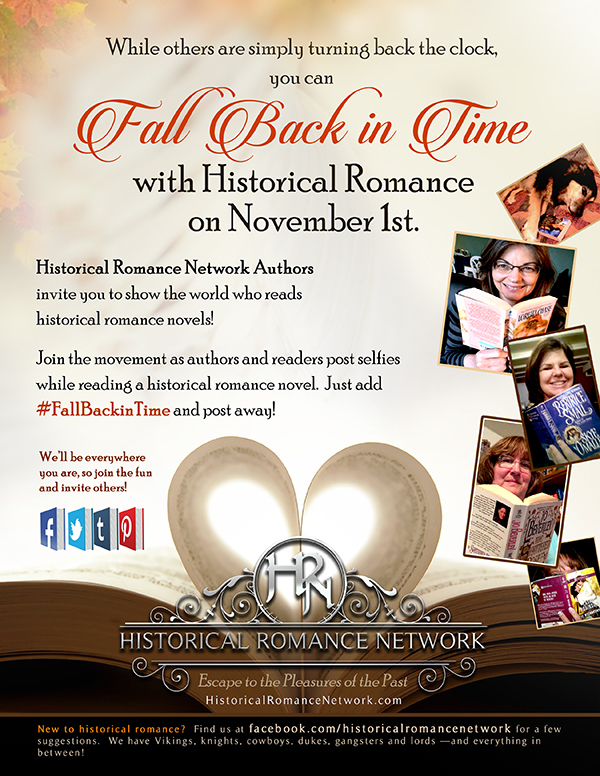 Historical Romance Network has a fun event going today to coincide with the time change. You know, the turning back of the clock I’ll forget about as soon as I finish typing this. To celebrate historical romances and our modern love affair with the selfie, post a picture of yourself holding your favorite historical romance, and add the hashtag #FallBackInTime. There are contests you can learn more about at the event page. Of course, I love historical romance. It’s my favorite genre to read. 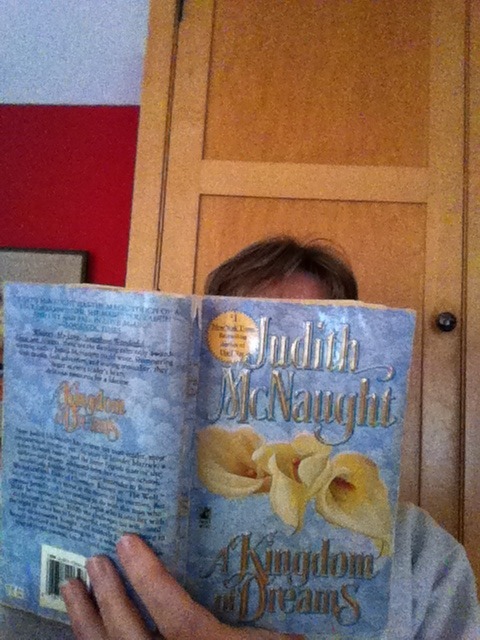 So, my selfie is with Judith McNaught’s A Kingdom of Dreams, a classic historical romance from 1989. I’m showing very little of myself because it’s a writing day and nobody wants to see me on a writing day…. Saturday is usually reserved for a first meeting excerpt, so I’m going to share a few paragraphs of Ms. McNaught’s story, and you’ll wonder how she ever brings these two people together for their happy ending. ‘Tis said he eats the flesh of those he kills…. Young Thomas’s words came back to her while rage blended with the sound of Brenna’s scream and the calls for pity from the prisoners. The rope around her arms was suddenly jerked loose. Driven by the twin demons of fear and fury, Jenny surged clumsily to her feet, her arms flailing at the cloak, looking like an enraged ghost trying to fling off its shroud. And the moment it fell away, Jenny doubled up her fist and swung with all her might at the dark, demonic, shadowy giant before her, striking him on the jaw bone. “What the—!” Royce Westmoreland roared, and reaching out, he caught his assailant at the waist and jerked her off her feet, holding her at arm’s length, high in the air. It was a mistake. Her booted foot struck out again, catching Royce squarely in the groin with an impact that nearly doubled him over. Not a very promising beginning, but believe me, they do warm to one another. Lovely stuff. Anyway, go revisit one of your favorite historical romances and join in the fun by posting your own selfie on whatever social media you like. You could share in on the event page or my Facebook page www.facebook.com/jillhugheyromance, or mention @jillhughey if you tweet it. Just remember to use the #FallBackInTime hashtag. And then check out other people’s posts to discover some new authors! And set back your clock tomorrow….